Maria Butina loves guns, has ties to a top Russian banker, and - after months in a US jail - now admits conspiring against the US government during a period in which relations with Moscow went into freefall. She has pleaded guilty to being directed by a Russian government official to "establish unofficial lines of communication with Americans having power and influence over American politics". The 30-year-old Russian activist has not been accused of being a spy. And her case has no connection with the Mueller inquiry into allegations of Russian meddling in the 2016 Trump election victory. But it does involve meddling with Republicans and Russia has smelled a rat, accusing the US of breaking her down in solitary confinement. Her arrest in July was revealed within hours of President Donald Trump's heavily criticised Helsinki summit with President Vladimir Putin. And Russia detected a political motive aimed at undermining the meeting. President Putin spoke out this week, complaining that "our Butina" was facing jail and had nothing to hide. "I asked all the heads of our secret services what was happening. No-one knows anything about her," he said. Born in the southern Siberian city of Barnaul in 1988, according to her Facebook page she has enjoyed using weapons ever since she was a child, picking up a gun for the first time at the age of 10. She went to the local Altai state university to study political and educational science, according to her Facebook page. She appears to have been politically engaged and active in the university debating society. Butina then set up a private furniture company, travelling widely abroad and remaining politically active with the youth wing of Vladimir Putin's United Russia party. And yet she attracted praise from opposition leader Alexei Navalny, who spoke of her as a "decent person". Promoting gun rights was clearly a deep passion, as she founded a group called the Right to Bear Arms and called for the sale of short-barrelled firearms to civilians to be made legal. This, she argued, was "one of the last wishes of Mikhail Kalashnikov", the inventor of the AK-47, and her movement attracted support nationwide. The Russian edition of GQ magazine wrote an admiring profile, complete with photos of her in high heels and Versace, with revolvers in her hands. Her self-defence drive fell flat because of government opposition. But her movement continued to grow and one of its members was Alexander Torshin, a member of the Russian senate and deputy chairman of the Russian Central Bank. In 2012 he became a life member of the National Rifle Association in the US. His ties with the NRA endured and Maria Butina became his "unpaid special assistant". Mr Torshin was placed under US Treasury sanctions in April, and is being investigated by the FBI over allegations of funnelling money to the NRA to aid the Trump campaign. Although unnamed in the plea deal, Mr Torshin is clearly the Russian with whom Butina has admitted conspiring. He retired from the bank at the end of November. Butina began travelling to the US for NRA conventions, apparently armed with a plan called The Diplomacy Project, aimed at setting up unofficial channels aimed at influencing US policy. In 2015 she attended a Trump campaign event in Las Vegas, asking the presidential candidate about his views on US sanctions in Russia. In December 2015 she invited NRA officials to Moscow, and they held meetings with "high-level Russian government officials" organised by Mr Torshin. By 2016 she had a student visa for a Master's degree at American University in Washington DC. Her LinkedIn profile said she was focusing on "cyber policy, the Internet of Things, cryptocurrencies and blockchain technology". She was living at the time with 56-year-old Paul Erickson, a South Dakota-based conservative political activist. He is alleged to have helped her pursue her plan. She attended a National Prayer Breakfast in 2017 in the US when President Trump gave a speech. "It is important to support Trump morally," she was quoted as saying in the Russian press. Political expert Andrei Kolyadin used her as an interpreter at the event and told Interfax news agency she had been considering what she should do after graduation in May. Whatever her plans, gun rights remained close to her heart and she kept several active social media accounts as well as a blog. She never shied away from a public profile. In one piece on the Russian Snob website she said her dream was "to live in a prosperous, highly developed country, leading in the world, and without migration". In another interview in 2016 with the Russian-based Guns website, she said she hoped that the Russian government would allow her organisation "to work with young children in schools" - like the NRA in the US. Alexander Torshin has made no comment on her arrest. However, Butina was a main point of contact in Russia and the FBI said the two shared a string of messages. Since her arrest she has been held at an adult detention centre in Alexandria, Virginia, and sometimes in solitary confinement, say her lawyers. Under her plea deal on Thursday, Maria Butina admitted to one charge of conspiracy. She is likely to face up to six months in jail, although she has already served five. 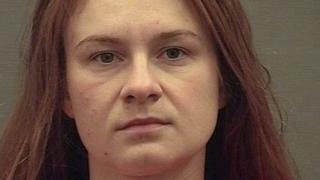 Her lawyer, Robert Driscoll, said in July she was an "ambitious young woman" and not an agent of the Russian Federation. At the time he was adamant there was no evidence against her. Her father Valery has called the charges against her "psychopathy and a witch-hunt".